Cookin' Sisters: Chicken burritos and homemade chips! 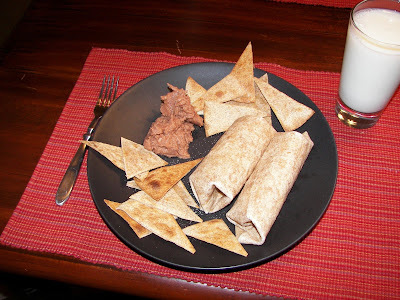 Chicken burritos and homemade chips! This is a really simple and fast meal, but it's always nice to have some of those, right? To make the chips, use a pizza cutter to cut triangle shapes out of the tortillas. Spray a cookie sheet with cooking spray. Place the chips on the cookie sheet. Spray the tops of the chips with cooking spray. Place in the oven and broil on high for 1 minute, turn the chips over, and broil for 1 more minute. Be careful and watch the chips, I thought I could leave one batch in there for a second while I finished something else up, no way...they were toast!! This picture is compliments of my cute husband. He wraps his burritos so nicely, and his plate looked very artful. I thought so, at least. I asked him if he'd take a picture, and even though he was starving and didn't want to ... he relented. Bless his heart. I was feeling so adventurous this weekend and I tried the homemade chips. After burning about 4 or 5 tortillas worth (you weren't kidding when you said make sure to watch them!) they turned out pretty well. Bless his heart indeed! Those look awesome.